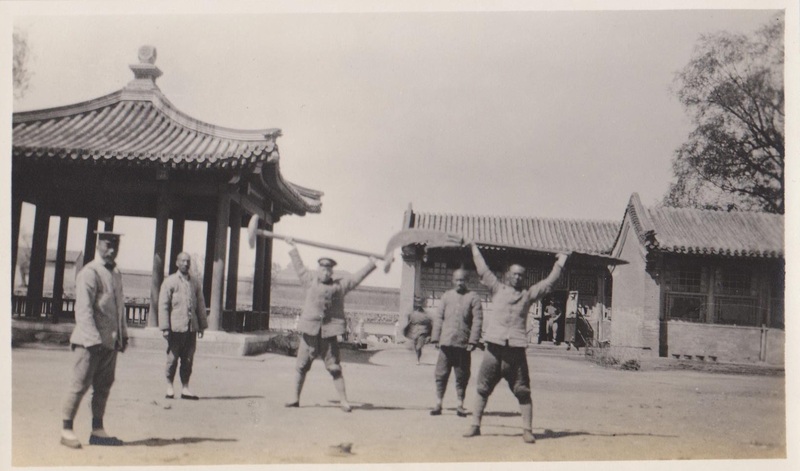 A postcard showing martial arts performers in Manchuria, pre-1911. Source: Authors Personal Collection. One need not be a martial artist to notice certain changes in how we are thinking about strength training in the west. All sorts of physical condition techniques that were popular at the turn of the last century are once again making an appearance in well-appointed gyms. Kettlebells, medicine balls and Indian clubs are making a noticeable comeback. And fans of “interval training” are rediscovering such low-tech training tools as jump ropes and the simple joys of going six three minute rounds against a heavy bag. One cannot help but think that our grandparents would be proud. Even in the world of physical fitness, everything is a remix. This trend is even more evident in the Asian martial arts. Certain fighting systems, including a number of schools of Okinawan Karate and Indian, wrestling never gave up their traditional training and conditioning tools. And in other areas, such as the Chinese hand combat systems, there seems to be a renewed interest in these earlier training methods. At least part of this stems from a growing appreciation of the role of strength training and basic fitness in any martial pursuit. The “relaxation” emphasized in arts as diverse as Taiji and Wing Chun is really only a meaningful concept if one has already mastered the strength and dexterity necessary to actualize the various strategic concepts of these arts. Kettlebells in particular are making inroads in a number of schools. Yet occasionally students seem to prefer something a little more traditional (or perhaps “exotic”). This has led to two things that I personally find quite interesting. The first is a revival in traditional training tools, such as Stone Locks, Weighted Pots and Stone Wheels that have rarely been seen outside of a few very traditional Karate classrooms in the post WWII period. Going along with this, there has also been a growing awareness of the importance of weapons (particularly longer pole weapons) as strength training tools. While these sorts of regimes seem to have diminished in importance within the Chinese martial arts during the post-WWII period, at one point they were a critical part of basic training in many styles. “Stone Locks” are blocks of concrete or stone that have been carved to resemble a squared off traditional Chinese padlock. Records of their use go back to the North Song dynasty, though they appear to have particularly popular during the Ming and Qing eras. They have been used both as a basic strength training tool (similar to dumbbells) in a variety of martial traditions in both northern and southern China. In fact, it was probably from White Crane practitioners that their use was first transmitted to Okinawa in the 18th or 19th century. Skilled practitioners not only lift these blocks, but they can swing and throw them in ways that seem to defy gravity. “Stone Wheels” are basically stone or concrete barbells. These can be used in ways that are very similar to modern free-weights, or they can be manipulated in acrobatic feats of strength that would generally be frowned upon in most modern gyms. 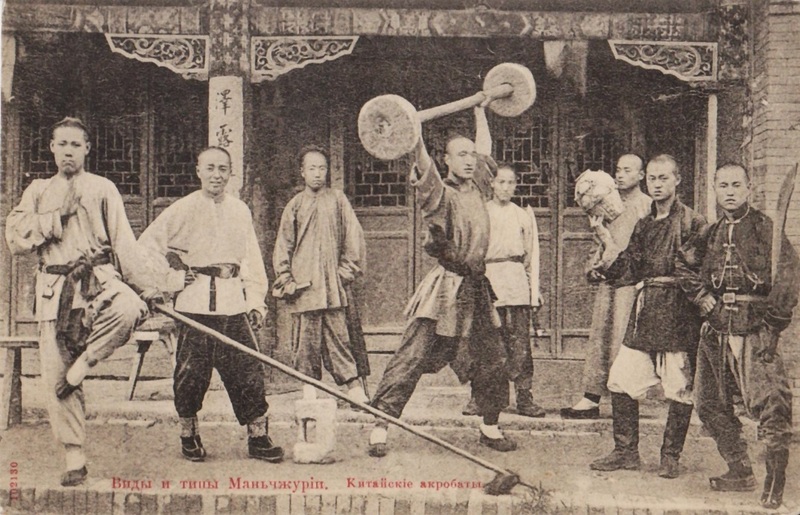 The very first image at the top of today’s post shows a group of martial artists in pre-1911 Manchuria posing with their training equipment. As we would expect there are a number of traditional weapons in the photograph, including a heavy spear and a couple of very healthy looking ox-tailed daos (a sword design that was quite popular with civilian martial artists at that time). But readers should also notice the Stone Wheels being hosted high in the middle of the shot, as well as the Stone Lock on the ground to the left. The boxer on the right is holding a weighted pot. These are also a common training tools seen throughout the Asian the martial arts. Often the practitioner will hold them by the rim using only the tips of their fingers to build hand and arm strength. Chinese acrobats also developed other ways of manipulating and juggling these pots which required both strength and dexterity. Our second image also focuses on traditional physical training equipment. This is an original photograph from the author’s personal collection. It was taken in the Winter Palace in Beijing sometime during the 1920s or 1930s. I like this photo precisely because it is so stark. It is a nice reminder of what barracks life was probably like during the Republic period. Two soldiers in the center of this image are posing with various pieces of strengthening gear. The individual of the left is holding a set of Stone Wheels, much like the ones already seen in the previous picture. The individual on the right has something a bit more interesting. It is essentially a very large, overbuilt, iron Guandao called a Wukedao (Military Exam Knife). These Military Exam Knives (or more commonly Heavy Knives) were used in the evaluations of candidates seeking a commission through the Imperial examination system. We have discussed these tests in a few other places. The most important skill that they emphasized was archery and horsemanship. Students were also expected to be able to write essays on the Confucian and Military classics (proving that they had basic literary skills). But being able to perform feats of strength was also a critical part of the selection process. These tests included pulling very heavy bows, lifting stones, and demonstrating the ability to perform a routine with the wukedao. These included complex movements such as twirling the weapon on ones back and around the neck. Various weights are given for these heavy knives ranging from estimates of 40 – 200 lbs. I suspect that something in the middle of these two numbers was probably more standard. Obviously the manipulation of the wukedao required not just great strength but also dexterity and practice. Because of their role in the military examination process the Heavy Knife was commonly encountered in all areas of the empire. It was seen in both the north and south. Nor was its use confined just to the examination process. Multiple accounts indicate that it was often demonstrated and practiced as part of regular military drill and parade. Various civilian boxing and wrestling schools also employed the wukedao as a strengthening tool. While Stone Locks are currently enjoying something of a revival on both sides of the pacific, the Heavy Knife has not been so fortunate. It is still actively practiced by a number of ethnic minority Hui martial artists. But possibly because of its unwieldy size and greater danger, its popularity remains limited. In the next section of this post I would like to briefly review three historic accounts of traditional Chinese strength training. These range in date from the early 19th century to the very first years of the 20th. The explosion of interest in martial arts training manuals that occurred in the 1920s and 1930s resulted in a number of interesting accounts of traditional physical condition techniques in the Republic period. Nevertheless, the accounts below predate these later records by decades, and in some cases generations. They offer an interesting glimpse into the world of traditional physical training long before the debates of the May 4th Reformers. The first account is perhaps the most important for readers who are interested in Stone Locks. It’s a brief (and not entirely complimentary) English language review of a simple martial arts manual (now lost) published in the 1830s. Much of the basic training advanced in this work revolves around the use of Stone Locks. The second selection is a much shorter quote from a longer article on the financing and economic organization of the Chinese Imperial Army written by a British military surgeon who had served in the area during the 1860s. Any serious military historian interested in the Taiping period will want to review the entire article carefully. But for our purposes I have focused on a single section where he discusses the use of heavy metal weapons (including both wudao and jingals) in military drills and parades. The last excerpt is also taken from a longer article that some readers may find interesting. 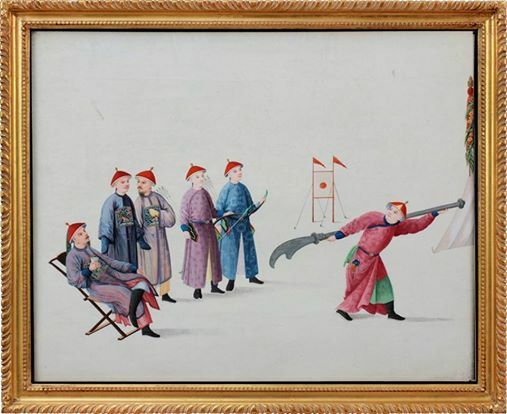 In the early 1900s Dr. Isaac Taylor Headland, a University Professor and missionary in Beijing, responded to a requests by Dr. Luther Gulick for information on the types of games and sports that were popular among Chinese children of various ages. Individuals interested in China’s indigenous physical culture will likely find Dr. Headland’s entire article quite interesting. I have excerpted just the section that bears on traditional strength training. It should also be noted that Dr. Gulick was not only an important advocate of the YMCA movement, but that he was a critical figure in the invention and popularization of basketball. “Some regiments have a certain number of men, armed with large jingals [note: a very large black powder musket often requiring two men to operate used for siege defense], attached to them. They take part in the exercises at their parades, which appear to consist of a series of movements in marching and countermarching, the whole having a pretty scenic effect, well adapted for a pantomime. During these performances the gongs are struck, and the long trumpets are blown, and the drums are beat, so that there is a din of horrible discordant sounds, which, however inspirting to a Chinese soldier, are utterly intolerable to our ears, and are hardly to be classed as martial music (Fig. 19). “Still other games which illustrate this same theory, played by boys from 16 years upward, are Throwing the Stone Lock, Lifting the Stone Wheels and Pitching the Sand Bag, not to mention Running, Jumping, Swimming, and other Exercises which can scarcely be called Games. The first of these games is played with a large stone in the shape of a Chinese padlock. This is used in private practice much like dumbbells are used by Westerners, and thus used it often weights fifty to sixty-five pounds or more. When designed to be pitched, it is lighter, weighing only from fifteen to thirty pounds or more. The game is played, or more properly speaking the exercise is indulged in, by two or three, to five to six persons. They stand in a ring. One of them pitches the stone up into the air from ten to twenty or thirty feet, whirling it at times as rapidly as he can make it whirl, when it is caught by the one next to him as it comes down. To the looker-on it is a risky, not to say dangerous, game. The person who catches it, pitches it in the same way to his next neighbor, and so it goes around the ring. The Sand Bag is thrown in the same way. This is a bag filled with small bits of iron made round by throwing molten metal through a sieve into water, and is equal to the Stone Lock in weight. It, however, lacks the danger and risk, and hence the interest. Lifting the Stone Wheels.—Lifting the Stone Wheels is called Chu Tun Tza. This is a kind of dumbbell made by fastening two stone wheels on the ends of a pole or iron bar four or five feet long. These dumbbells weigh from seventy to one hundred and fifty or sixty pounds. The practitioner taking the pole in his two hands, raises it up to his knees, then to his body, to his breast, to his face and then finally above his head. He pushes it out in front at arm’s length, and often uses it in performing various feats of skill, such as resting it on his shoulders and neck and whirling it round. This practice exercises the majority of the muscles in the body. One occasionally hears assertions that strength training is unimportant in the traditional Chinese martial arts, or that Chinese boxers and soldiers did not value muscular development. A quick examination of China’s rich indigenous physical culture shows that this is simply not the case. While strength may have been downplayed by reformers seeking to create “martial arts for the masses” in the 1930s-1960s, this is not an accurate reflection of the genesis or original emphasis of these arts. The current revival of interest in traditional training methods and tools is timely precisely because it unites certain larger trends seen within the western physical fitness community with an interest in building a deeper understanding of indigenous Chinese physical culture. Some of these practices, such as swinging large iron halberds around one’s neck, seem unlikely to be adopted by most modern martial artists. But other tools, such as the time tests Stone Lock, are ripe for a comeback. Together these period images and accounts help to remind us of the place of strength training in the traditional Chinese martial arts. 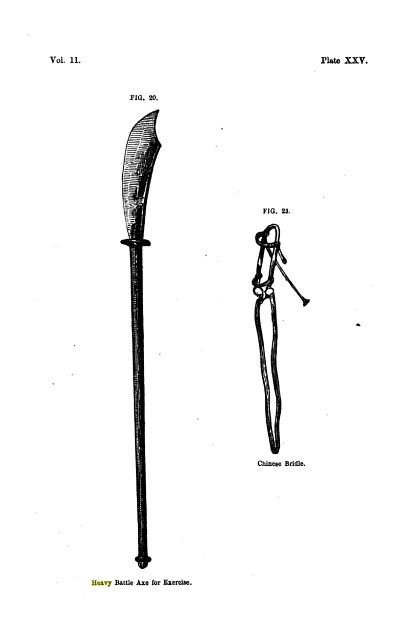 An 1867 print showing a wukedao (Heavy Knife) used in the imperial military exam. Source: Lampray, Journal of the Royal United Service Institution. Interesting article. If I had to guess, I’d suggest that the wukedao is the inspiration for the bisento used in Hatsumi’s ninjutsu. One correction: in every tai chi school I’ve been in, relaxation precedes any strength training with weights (this is also true for xingyi and bagua). There are two points: one is that the methods depend on primarily on leg strength, and using the legs to power the arms depends on relaxing the shoulders and back to use them for transferring energy, not generating it. Training your arms to lift independently rather misses the point.